The beauty of a city is defined by the people who protect it and keep the history and life it once knew. Progress is always taking place and like General Santos, this city is going forward but with caution to preserving the life that is known here. Not only does the region of SOCCSKSARGEN contain a large area to adventure through but it also is supported by one of the largest inlets in all of the Philippines known as Sarangani Bay. This calm deep water bay gives life to many white sand and blue water beaches from Sarangani Heights to Glan and to the south at Celebs Sea. I have visited this area many times. I spend most of my trips in the Sarangani Heights area as there is a lovely overlooking restaurant and hotel known as Sarangani Highlands Garden and Restaurant. It is famous in its own right and everyone around knows of it. When taking a trip to this area simply hire a taxi to the check point on the National Highway. The motorcycles will take you up the tall hill and drop you at the gate. Once you enter your world will be transformed by the beauty and painstaking love that has been put into this compound. The food here is superb in so many ways I cannot tell you how often I eat here and sit overlooking the bay at night. Rooms are beautiful as they should be and the grounds are a step above all in class and comfort. Below by the water’s edge there are many resorts. I stayed a few nights in the Tropicana Resort and it was very nice and beautifully set by the sea. From this region all the way to Maasim you can find the luxury of some well taken care of resorts. 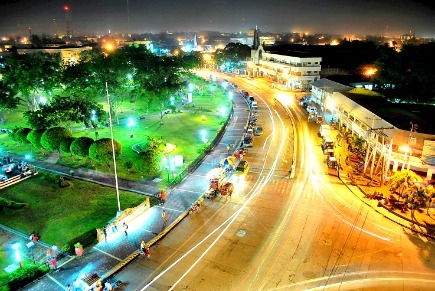 In the city of General Santos there are numerous nightlife clubs, live music and general places to sit, eat and enjoy. A large influx of malls in the last 5 years has added this city to a shopper’s paradise. Though the city itself boasts approximately 600,000 residents the whole region comes alive with industry like the world famous tuna ports which Gensan has been known for throughout history. The historical status of this great region is endless but its humble beginning is unique and well worth knowing and understanding. Access to this city is easy as they have a modern airport just outside of the metro area. Traveling by bus from other regions such as Davao or Cagayan de Oro area is an easy day trip as well. Once in the city, getting around by petti-cab or motorcycle is a simple cost effective choice. Others may choose to take taxis and anyone may want to venture on the jeepneys just to get the feel and sights of a unique city. I had the luxury of renting a van for the day and headed out for a few stops on my way to the Batulaki. This area is just south of Glan on the National Highway to the Celebs Sea. A stop in the Glan area was nice and unique and I met up with a friend there where we had a lunch and a nice time chatting for awhile. Once reaching Batulaki the driver took us to a resort where we spent a few hours and ate a nice dinner before heading back to the city. Trips like these are unique in that they are inexpensive with the van costing around 4,000 peso (around $100 dollars) for the day with driver and all. Along the way we made 6 stops and spent a long day venturing into areas not heavily traveled. The SOCCSKSARGEN region is large in size and has many places to see and visit. Hot spots for those traveling on the outer edges of this region might want to try Mt. Matutum, Lake Sebu, Mt. Busa and for the adventurous try Kiota Mountain range. Without a doubt there is much to see and do here and the list is endless to the resorts, restaurants, hotels and places to sit and enjoy around the clock. For your next adventure keep General Santos City in mind and take a walk on the wild side with the numerous ranges that surround the city itself. I for one look forward to my visits to this great little city. With one visit I’m sure you too will once again find your way back to a city that will mysteriously call your name time and time again.